Shopping for a Wig? Wig tips made simple with Wig Expert, Jeanna Doyle. Wearing wigs are now as important has the accessory you are wearing with an outfit. Putting on a wig is no longer a taboo and those who wear it adds more versatility to their looks. One person I think of when it comes to changing their looks and wearing wigs is my mother. I find her spirit to always to be open to change her looks, but when she got diagnosis with cancer things changed. 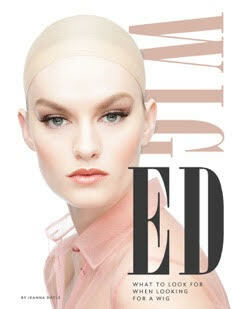 She didn’t want to have a wig that was noticeable that she was losing her hair let alone suffering from chemotherapy. I went with her to all the wig shops we could find but it became a stressful process. Learning more about Wig education from Jenna Doyle in my recent interview gave me the better insight in to finding the better wig. How did you get started with your work supporting those with hair loss? And was there a moment that inspired you to found Suite HOPE and/or write your new book, Wig ED? My career started in cosmetology, working in salons and with plastic and reconstructive surgeons doing skincare and corrective makeup. From there, I moved on to doing makeup for advertising and fashion in both print and television. When my girlfriend Ruth was diagnosed with cancer, I took her wig shopping. She told me after our successful shopping trip that she would have been completely overwhelmed if I hadn’t gone with her. That’s when it hit me that I knew a lot more about this than my friend Ruth, and women like her, did. I decided to start a support group to help women going through treatment, did advanced training in oncology esthetics, and soon, the support group idea became the nonprofit Suite HOPE (Helping Oncology Patients Esthetically). After starting Suite HOPE, I was looking for ways to raise awareness about the work we were doing and I was told the best way to get speaking engagements was to have a book. Since there was no book on the subject, I committed to writing Wig ED. Beyond hair loss from cancer or other health issues, why would someone be in the market for a wig? Wigs offer privacy, convenience or transformation. Besides the medical privacy a wig can offer a women going through treatment, the convenience of a wig can be all the difference for a women who is traveling and can’t bring her hairdresser with her. If a woman wants a certain look for presenting or business, a wig can offer her savings of time and money. As far as transformation, a woman can go from blonde to brunette and back again in the blink of an eye with no wear and tear on her own hair. Contemplating bangs? Wigs can be fast easy and fun and offer commitment free hairstyles that are both tempting and temporary. Can you share with us 3-5 common myths or misconceptions about wigs? Many people falsely believe that you need to spend a lot of money on a wig or else it will look fake. Manufacturing has come a long way, as there are now a large variety of both synthetic and human hair wigs available that are ready to wear and look amazing. Human hair vs. synthetics: Human hair wigs are great but they are also more expensive and require a lot more care than a synthetic wig. For example, a human hair wig, like your own hair, will lose its shape when it gets wet and needs to be restyled after washing. A synthetic wig, on the other hand, will retain its shape after coming in contact with water or after being washed. Many people believe you cannot do your favorite activity in a wig and that is far from the truth. People swim, workout, dance, date, have intimacy and even jump out of airplanes in wigs! Amy Gibson, former soap opera star and now wig designer, jumped out of an airplane without a helmet on a morning television show to show how well her wig tape works. What are five qualities every person should think about when buying a wig? It is important to consider, with caution, these five qualities when considering a wig. Long: Long wigs are heavier and tangle easily. Thick: Thick wigs can be hotter and point out a discrepancy with thinning eyebrows and eyelashes. Straight: Straight wigs can expose the hairline and part, two areas to consider concealing keeping believability high. Shiny: Excessive shine is a telltale sign you are wearing a wig. Solid color: An all one color wig lacks dimension and adding dimension adds believability. You also talk about other esthetic changes, like makeup, that can give survivors the privacy, confidence, and transformation they may be looking for. Tell us more about that. Makeup and wigs go hand and hand. The same reasons a woman would seek a wig, whether for medical privacy or transformation, is the same reason she would want to tweak the makeup colors she uses to be a more flattering match to her best look in a wig. The eyebrows often thin with age or shed with treatment so paying special attention to that can help you feel more like yourself in your new look. Is there anything else you’d like to share with us that we haven’t already covered? Wearing wigs can offer women lots of options. The hair color, style, length and other changes you can purchase in a wig would take considerable time and money to achieve in a salon, not to mention the wear and tear on your hair. My goal is to demystify the world of wigs. Suite HOPE has launched an initiative called Suite Solidarity in conjunction with August’s National Hair Loss Awareness Month. Every year, on the last Saturday of the month, we ask you to go out and wear a wig in solidarity or support of someone experiencing hair loss to help normalize the process for those you love. Try one on — they’re a ton of fun! Jeanna Doyle is a veteran makeup artist with over twenty-five years of experience working in both medical and media settings and the author of Wig ED. Licensed in cosmetology, a certified Medical Aesthetic Provider, and trained in oncology esthetics and corrective makeup, Jeanna is the founder of the nonprofit Suite HOPE (Helping Oncology Patients Esthetically) and the developer of The HOPE Method – a corrective makeup curriculum. Jeanna has written articles for and spoken to audiences of both medical and beauty industry giants, and has worked with A-list actors, athletes, models, musicians, politicians and a former president and first lady of the United States. For more information about Wig ED, visit www.wiged.com and learn more about Suite HOPE at www.SuiteHope.org. I am giving away 2 copies of Jenna Doyle book Wig ED: What To Look For When Looking For a Wig. Click here to enter! Disclaimer: This post is collaboration with The Mommy Cooler and Jenna Doyle. All opinions are our own. Pre-Schoolers can go Free to Busch Gardens and Water Country! Get the Pre-School Pass for the 2017 Season!